The idea behind this monetization opportunity is relatively straightforward: those visitors who are interested enough in your product to create a membership or join an email distribution list may also be interested in signing up for similar products from other sites. Co-registration makes it easy to enroll in multiple products or subscriptions at once; in most cases, the user just has to check a box to opt in to additional offerings. There are four offers presented to them here; by clicking the “Yes” button next to any of these and then submitting the form, the email address used in the previous step will also be passed on to these companies. The monetization is also pretty basic: co-registration works on a cost-per-action (CPA) or cost-per-lead (CPL) basis. The companies appearing on the co-reg page (Tablet and Colorescience in the example above) pay a fixed fee for each new account created through this process. In most cases, the publisher and the network will split the revenue generated. The amount generated by co-registration implementations varies; the premium section below has some additional estimates on the revenue potential. It’s important to note that the third-party offers are not presented to a visitor until after he has been processed as a new member or subscriber on your site. In other words, showing these offers will not jeopardize the addition of a new member to your list; by the time they see these offers, that has already been finalized. Co-registration is not a commonly used monetization technique, but it is one that many publishers could effectively use to develop an additional revenue stream. Co-registration is appealing in part because the revenue generated should be purely incremental; it will not cannibalize existing revenue streams in any way, and there is very little down side to including this on your site. Similar to display ads, co-registration can be sold in a few different ways. Ideally, you’ll partner directly with a handful of companies looking to reach your audience, and they will pay you for each email address captured. This approach, however, requires a significant investment in both developing relationships and developing the technology to serve and track the offers. For those reasons, almost all sites that run co-registration offers partner with a network who is able to handle the administrative side and also supply the advertisers. Though the space is not nearly as crowded as traditional display ads, there are a handful of co-registration networks out there that can provide high fill rates and decent RPMs. More information on these networks is included in the list of resources below. The success of any co-reg strategy depends primarily on the relevancy of the advertiser offers provided to your audience. 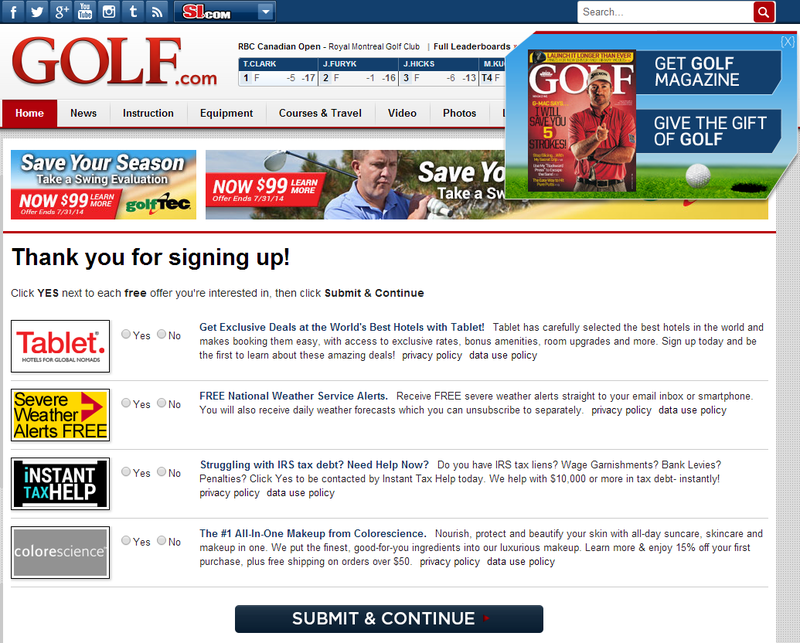 In the Golf.com example above, the offers given to visitors aren’t exactly hyper-targeted to golf fans. 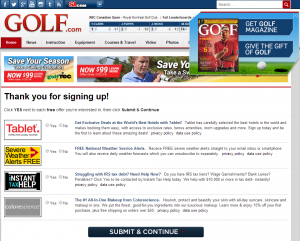 Ideally, Golf.com would like to see email newsletters from other golf services, or perhaps an offer for a special discount on lessons or equipment. The revenue opportunities will vary significantly depending on the nature of the site. In general, co-registration leads sell for $1 to $5. If the revenue is split down the middle, that means that each lead generated created between $0.50 and $2.50 for the publisher. The key factor is the number of leads generated per new subscriber. There is really very little that a publisher can do control this; it is up to the network to provide targeted, relevant offers that will see high conversion rates. In general, one lead can be expected for every two to ten visitors to the offer page (note that some visitors may result in multiple leads; if someone checked all four boxes in the example above, Golf.com could earn close to $10 from that visit). The result can be an extremely high RPM on the offer page. A 50% lead capture rate and a $2.50 fee per lead would translate to a $1,250 RPM. If the capture rate is just 10% and each lead nets just $0.50 to the publisher, the result is still a $50 RPM.